Our last casting call (also in Los Angeles) was specifically for DJs (Master of the Mix - still casting!) but today we were contacted by none other than America's Got Talent about their upcoming auditions. They know GigMasters is the place for all types of talent and that's what the show's producers are looking for: "any talent and any agest." They asked us to spread the word about their November 14/15 auditions taking place at the LA Convention Center and that's what we're doing! 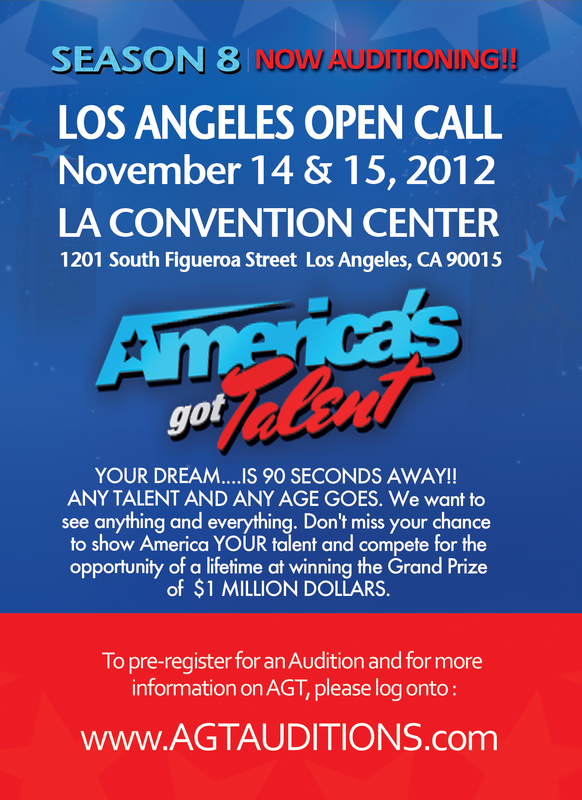 Click the flyer below or visit www.agtauditions.com for more info. You might remember that there have already been several GigMasters members that made it onto America's Got Talent. In fact 5-star GigMasters Mind Reader Eric Dittelman (Grafton, MA) made it deep into Season 7 - all the way to the semifinals. Read all about Eric's journey in this post.